Delphine Bernardin is associate Professor at the NSERG/Essilor Industrial Chair, University of Montréal, Canada, hold by Jocelyn Faubert. Based on the understanding of the interaction between human and visual complexity, the Chair has an impressive story life from 2001 until now, fostering innovation in the field of optics, perceptual and cognitive health. Exploring and developing new innovative concepts from knowledge transfer is one the most important challenge of the chair. She received her PhD in Sport and Motor Function Sciences from the University of Paris Saclay, France, in 2005. The PhD was focused on the haptic perception and control of multi-jointed arm reaching movement. She was member of the ENACTIVE European Network from 2004 to 2007 dedicated to the man-machine interfaces and obtained for the same topics a European Marie Curie intra Fellowship grant in 2006. She performed a post-doctoral training at MusicTech and CIRMMIT laboratory, McGill University, Montréal Canada from 2006 to 2007. Then, she did a postdoctoral training in physiology of perception of action at College de France, Paris, from 2008 to 2011. 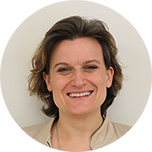 Under the supervision of Alain Berthoz, she worked at the Department of Innovation and Development of RAPT, French transportation Society, then as member of the European Project Robosom. In 2011, she joined Essilor International at the research and development vision sciences team.